​INDUSTREX DR50 Film is specifically designed for use in multi-film techniques in your demanding radiographic environment. 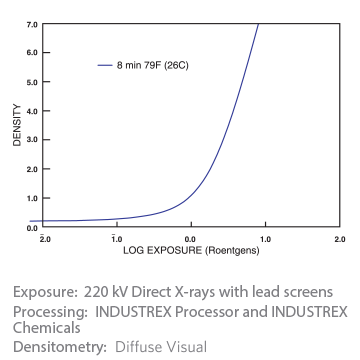 With both high-voltage x-rays and gamma rays, DR50 will deliver consistently high contrast, very fine granularity, and superior sensitivity to meet your testing needs. It incorporates Carestream Health’s patented T-GRAIN Emulsion technology for superb results with direct x-rays or lead foil screens. DR50 Film is an extremely durable slow-speed film with ultra fine grain. It withstands high temperature and high humidity, and resists both handling and static artifacts. This film is classified as ASTM E 1815 Class Special and EN ISO 11699-1 Class 1. DR50 Film can be processed manually or automatically in a range of processing cycles. Notice: Observe precautionary information on product labels and Material Safety Data Sheets. Develop with rack and tank, using properly replenished solutions.